Another week another make has been completed. I don’t know about you but I have got into the habit of carrying a little craft project in my handbag so that whenever I’m waiting somewhere (and this mama does a lot of waiting) I can just take out the cross stitch/crochet and do a little bit. 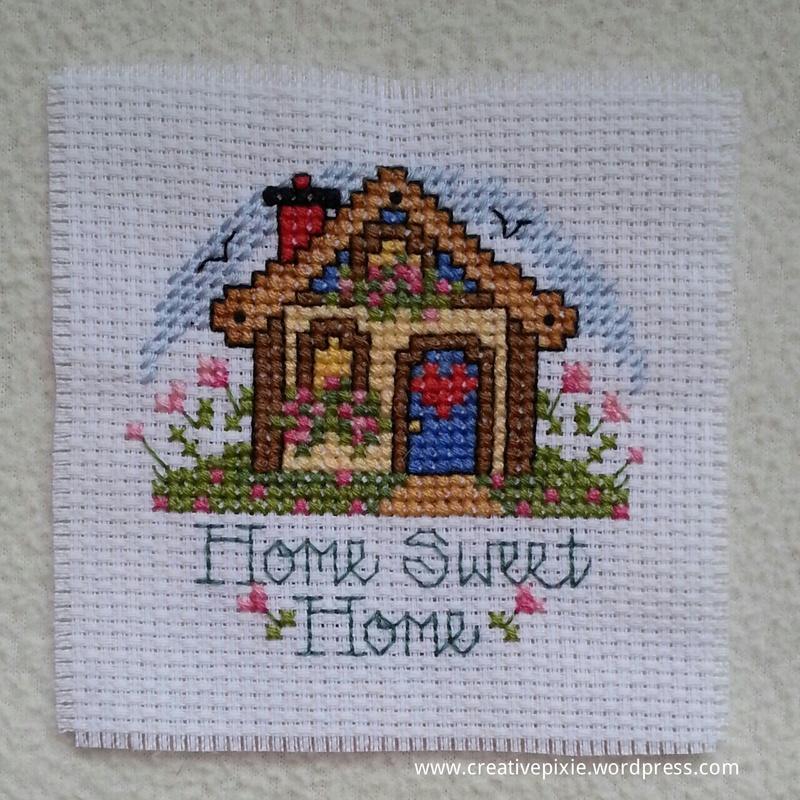 This weekend I completed a little cross stitch. 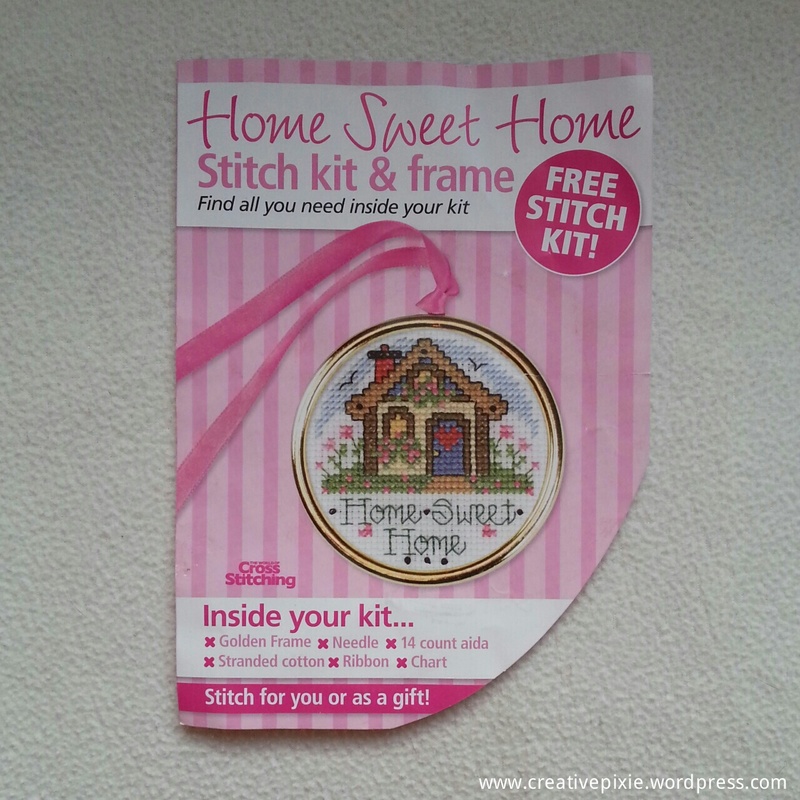 It was one of those freebies that came with The World of Cross Stitching magazine a while back. What put me off doing it was the horrible plastic gold frame that came with it – urgg! Then I thought that it was the perfect size for a coaster. I sent husbandy off to the craft shop and he came back with this 4×4″ perspex coaster. I had hoped to put some fabric onto the rear of the cross stitch to hide the stitches at the back of it however there wasn’t enough room between the perspex layers as it is designed to snap together. If anyone is interested check out all the crocheted hexagons that Crochetime received this week for her ‘Crochet for Kidneys’ campaign – so many pretty colours, the blankets are going to look amazing! Neat coaster, and why for goodness sake at my great age did I never think of having a handbag project. DOH! Ha ha – it’s only a recent thing for me. Tell you something, it’s surprising how much you can get done – it all adds up. What a very cute project. I love the square coaster. Great, quick project. I must show my cross stitch from the summer, been meaning to for months. This is very, very cute! Thanks. 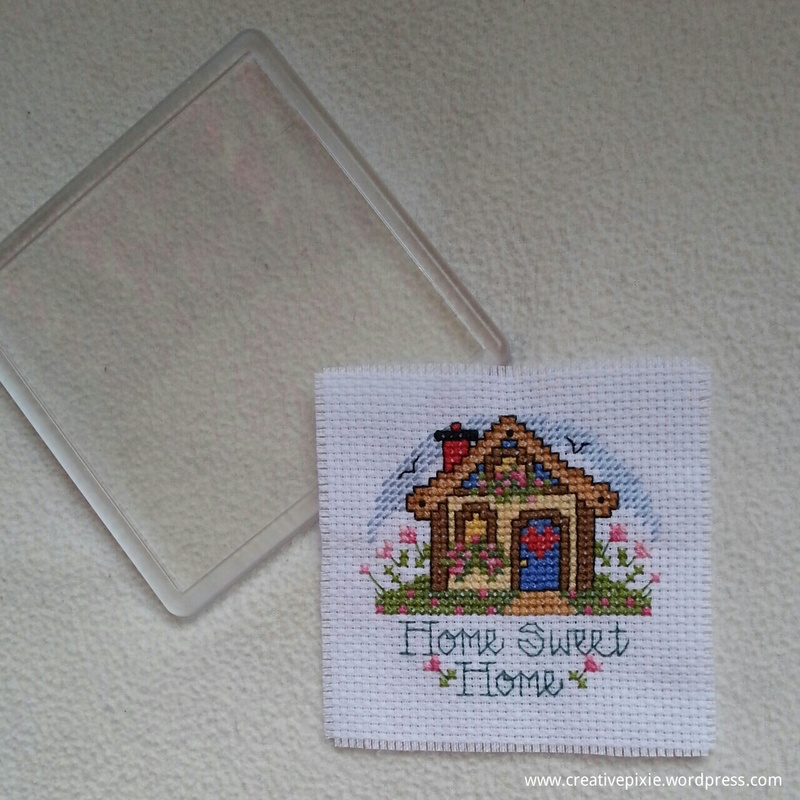 I love cross stitch but I tend to do loads then not do any for a while. I’m in the ❤ stage at the moment. This is so cute! I have this completed project somewhere… I agree that the frame isn’t great! I love the idea to transform it into a coaster! Thanks, I’m now looking to see what other ones I’ve got that could be coastered (if there is such a word). Haha if there isn’t, there should be! 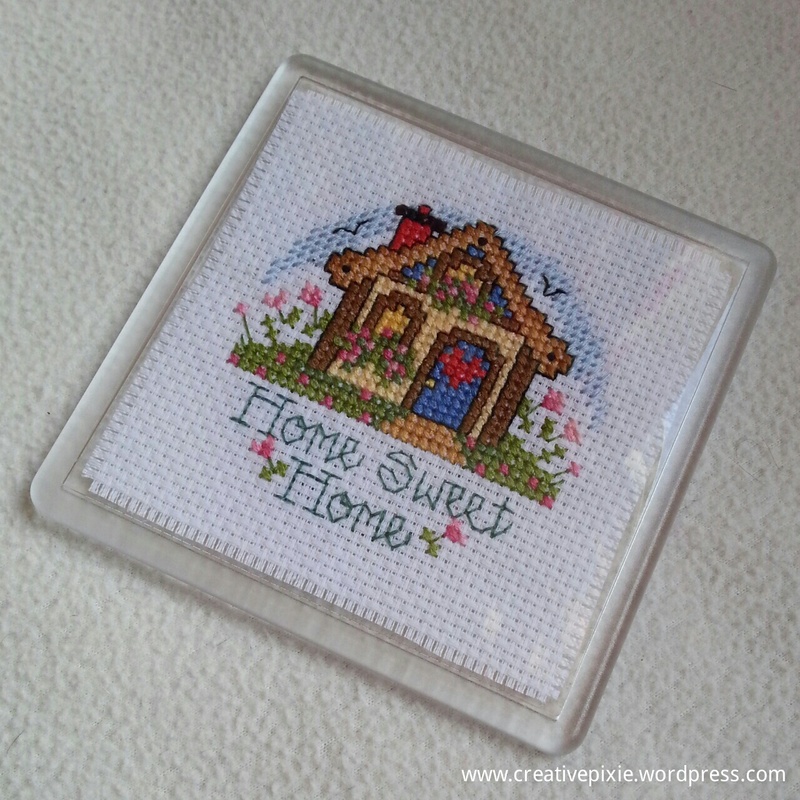 An absolutely sweet cross stitch design that got a bad rap from the plastic frame…you’re solution is superb!! Great hubby, too. Thanks I’m lucky that he supports my crafting (it probably helps that I don’t mind him buying books as he’s an aspiring writer). Oh what a cool idea! So clever and cute. I’m with you I like having a project with me so I never feel board or like I’m “waisting” my time. BTW I made your flower book marks for my writer’s group. I’ll be handing them out tomorrow. Thanks for the great project. I love your coaster! I have this kit and one other in my bag to pull out and work on whenever I have to wait Now I know what to do with this one when it’s finished! I think the only change I made to the stitch design was to not do the french knots around the wording and I made a flower stalk bigger on one side than the other. While I cross stitch and needlepoint, have to comment on the too cute crochet projects. And how wonderful that you promote charitable causes! Thank you for visiting my blog too. love yr coaster!! great job!! found you after you followed my blog, Smudgemakes! Thanks for the follow! I loved stitching this and you’re right the little hoop isn’t the nicest and I think I might change it for a real hoop or wrap it in ribbon! That is so cute !!! Would you want to post SEWING PATTERN TO THIS MODEL? I want to make it myself! The thread, what numbers you use? I’m from Romania … I hope I spelled correctly. Thank you ! Sorry if don’t have the pattern anymore, it was from a magazine. Ok , thank you !